Panna Cotta. What can I say that hasn't already been said? It's easy, takes only a few minutes to make and can be fancied up or made casual. Pair it with a sauce and you've got something extra special. I love this version made with coconut milk. It reminds me of sunny days. Although I love snow and cozy sweaters, I find myself fatigued by this frigid weather. It's flurrying outside- again. It makes me yearn for a warm evening when I can go barefoot and sit on my front porch rocker. Maybe with a cool and creamy treat just like this. Heavy cream is most commonly used in panna cotta, although you can substitute half and half or even whole milk in this particular recipe. 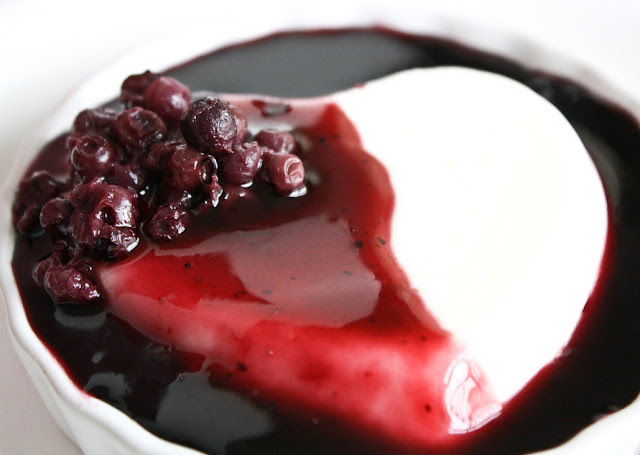 See Coconut Panna Cotta withBerry and Red Wine Reduction on Key Ingredient. 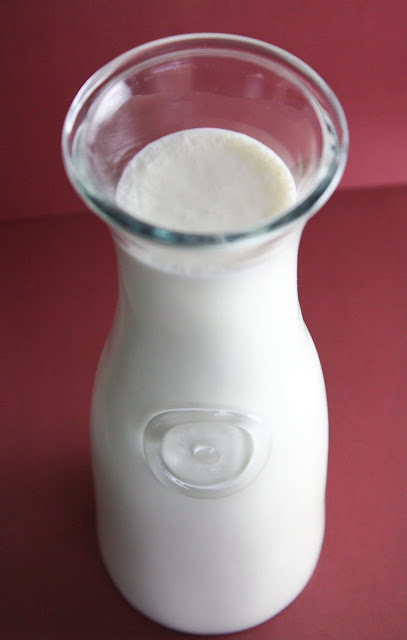 It's pretty when poured into glasses, but you can also use buttered ramekins for molding. 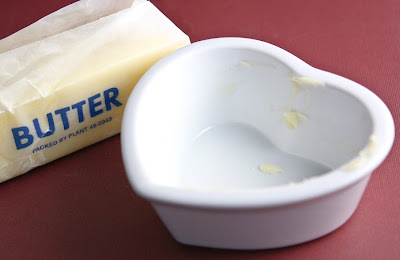 I have a few heart shaped ramekins that I had planned to use for Pots de Creme, but I just haven't had the right flavor inspiration for them yet. Biscuit stopped by to stick his nose in the butter. He would have tasted it too, had I not shooed him away. If you're curious, I disposed of the piece of butter his nose touched. He is into everything, and so is his nose, so there's no telling what's on it. When the custard is set, run a sharp knife along the top edge and hold the bottom of the ramekin in a bowl of warm water for a couple of seconds. Invert onto a plate, and with a couple of gentle shakes it should unmold easily. The sauce is really good. It provides a nice contrast against the creaminess of the custard, without being tart. 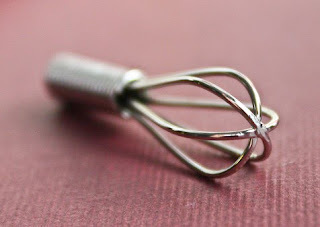 One thing that is essential for this recipe, is a good whisk. You'll be whisking a very lumpy gelatin mixture into a simmering pot of cream. 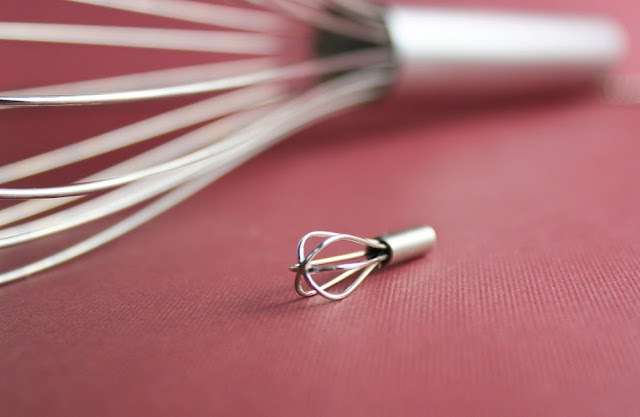 I recently found a new whisk. Perhaps I should put it into better perspective. 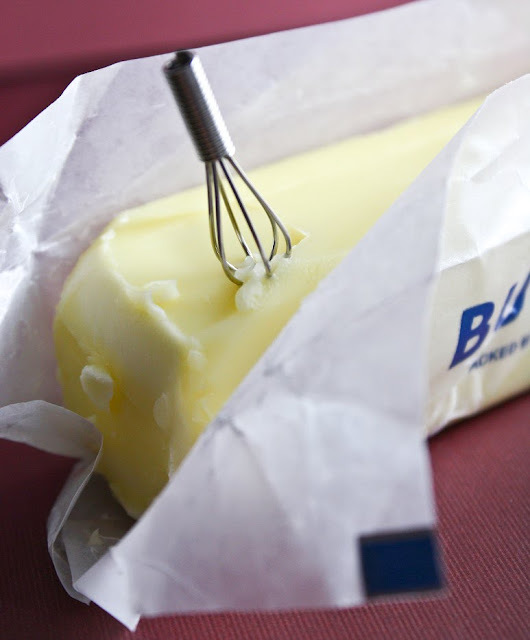 World's largest stick of butter, or worlds tiniest whisk? If I don't post again before Valentine's arrives, I hope everyone has a great day! I wish you all love. Lots and lots of it. WOW! This looks amazing! I don't think i've ever made that before but you made it look easy. And I LOOOVE that tiny whisk, too cute!! That whisk is the cutest! I have never made the panna cotta. You made it look easy and not scary at all! Love the whisk!! 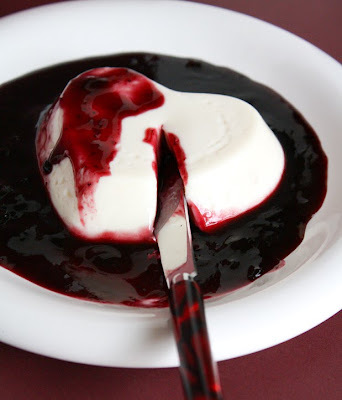 I have never made a panna cotta and this looks great! May have to try it out this weekend! Panna cotta has never really interested me before, but for some reason coconut panna cotta just changed my mind! Great pics! I love the with your dog! The doll-size whisk is too adorable. I bet it would make a fun charm for a necklace, too. 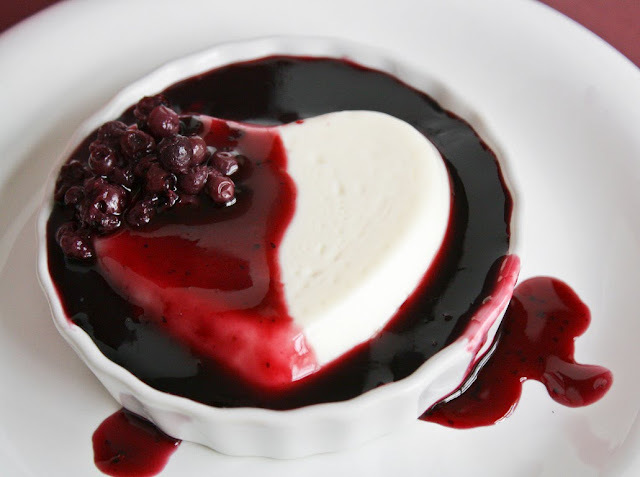 Every time I see panna cotta, especially one as gorgeous as this, I remember how much I want to try making it myself. I've eaten plenty, but never attempted my own. This is stunning, and sounds amazing. 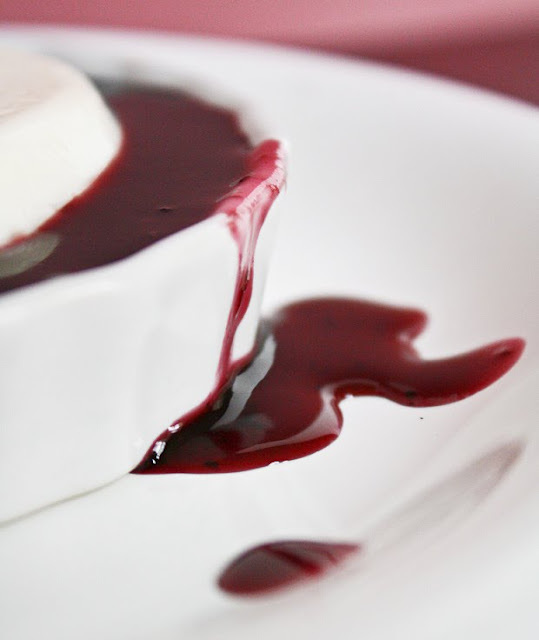 Your panna cotta looks so smooth and creamy, and beautiful with the sauce! The little whisk is so cute, and so is Biscuit! He cracks me up! This looks and sounds delicious. I love using wines for reductions (fortified as well), and the compliment to the panna cotta sounds excellent. 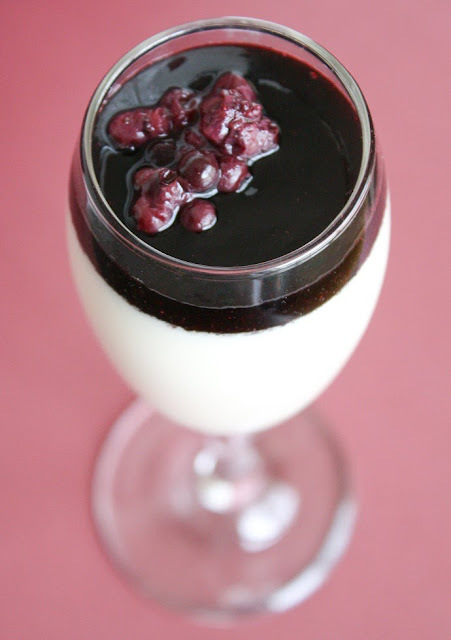 This panna cotta looks delicous! I love the heart shape in the last picture! Thanks for sharing. I have a tiny whish too but it's not quite that small. I've been wanting to try making a panna cotta. I even have some vanilla beans to use it but have always been leery. I just found your blog today, and I've already bookmarked at least half a dozen recipes. I love the little whisk! I'm kind of silly about miniatures too. I once left a paper bag of groceries on the floor while I ran out to the car for the rest of the bags. By the time I got back in the house my dachshund had torn the bag open, ripped the box of butter apart, and eaten half a stick of it! 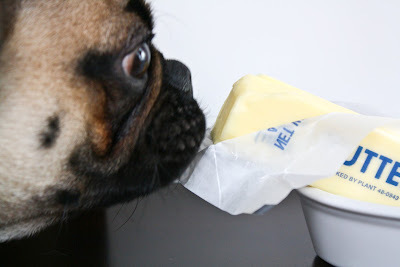 I love butter, but not as much as him it seems! Heather i stumbled upon your website when looking for recipes and absolutely all of them look amazing! I have vowed to make at least one each week until the end of summer. All I can say is keep cooking because i can't wait for more recipes! Where did you get that tiny whisk?